It is important not to lose sight of the fact that railways were developed first and foremost for moving freight. 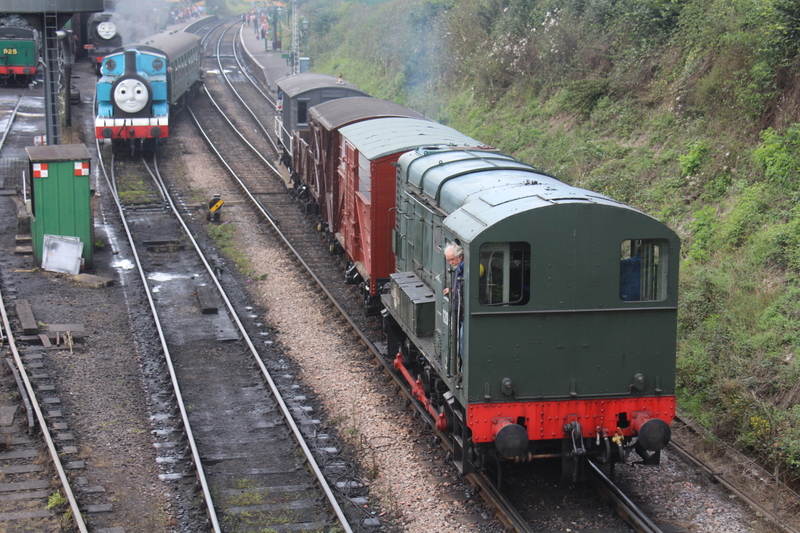 On the modern day heritage railway, except when charters are run, a goods train rarely directly generates revenue, for the days of pick-up goods are long gone. It is therefore especially pleasing to see the lengths that preserved railways go to tell the tale of the goods train, as quite frankly it’s an expensive story to tell! In steam days before road traffic became the dominant mode of transport for freight, what is now known as the Watercress Line was a rural secondary route and cattle would have been a commodity transported by the line, as evidenced by the Cattle Dock in Alresford. Naturally, the Watercress Line is the ideal preserved railway to be home to a wagon built to move cattle. However, despite having a fantastic selection of wagons, the heritage line was crying out for a cattle wagon. However none of the Southern Region’s Diagram 1529 cattle wagons had (as far as we know) survived into preservation. Undeterred, the railway has recently managed to re-create cattle wagon S 53845 and it was unveiled on July 25th 2015 in memory of John Elliott and Jim Pitt, both long serving editors of the Watercress Line’s publication the ‘Mid Hants News’. Its recreation is itself quite a story, as follows! 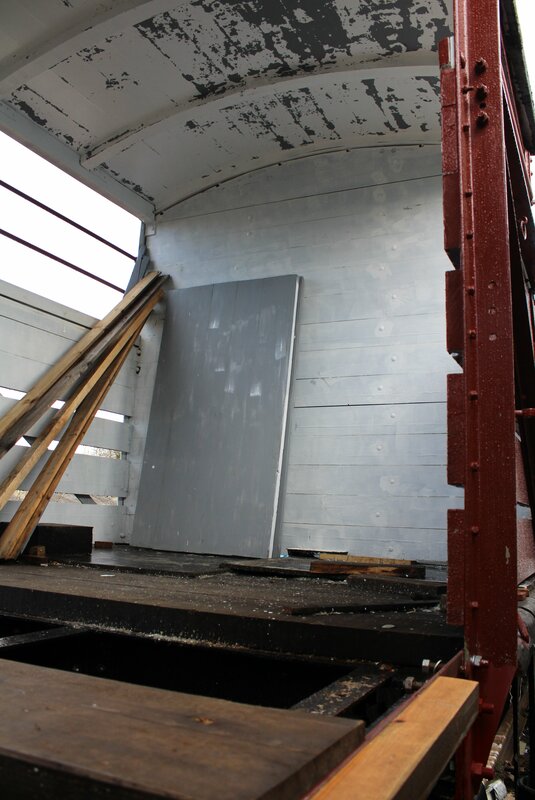 Two years ago a project was started by the Mid Hants Wagon Group to convert an old LMS sliding door Vanfit M 514791 into a Southern Railway Diagram No 1529 cattle wagon. M 514791 was of some interest as it was built by the Southern Railway for the LMS in 1942, but as several other similar LMS vans built by the SR exist and the Mid Hants has other examples of LMS sliding door vans, it’s transformation would not be as great a loss as compared to the gain of a lost type. The SR Diagram 1529 cattle wagon was based on a 10 foot 6 inch wheelbase and was 19 foot over headstocks, whereas the LMS van being converted was10 foot wheelbase and 17 foot 6 inches over headstocks – so accordingly many dimensions from the original drawings had to be amended. By not rebuilding the under frame of the LMS van, there is of course a slight reduction in the overall length, compared to the original SR Diagram. However unless one takes a tape measure to it, it is not really noticeable. From the CAD drawings some of the more complex steel sections were fabricated by an outside metal workshop, but the majority of the work was undertaken by the Wagon Group in-house engineering team.In July 2013 physical work started by stripping the LMS van of old timbers and steel work and de-rusting the under frame at Alton. After this preparation work was largely completed the vehicle was moved to Medstead yard where the majority of the two year, and approximately 2,500 man hours, of engineering work was undertaken. The cattle wagon number S 53845 was chosen as it was a gap in the SR numbering and the finished result is quite a transformation! It was moved to Alresford for the 25th July unveiling along with a couple of other wagons and it looked very much at home in the “cattle dock” siding at Alresford. It was in the early 1960’s that the last cattle were loaded here and transported by rail. The cattle wagon is pictured above at Ropley, shortly before the Day Out With Thomas Summer hauled by heavy freight locomotive BR Standard 9F 922212 and below discretely staring in the event as part of Diesel Shunter class 11 12049’s short train for brake van rides. If you would like to see the cattle wagon on the “moove” yourself, then come to the railway on the freight train running days of 19th and 20th September 2015. 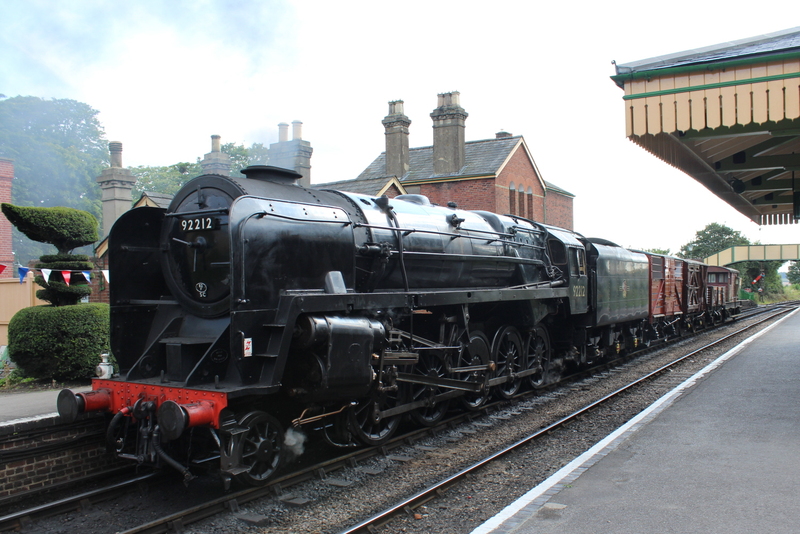 21/08/2015 in News - Preserved Railway, Watercress Line. That cattle wagon does look the business cant wait to see it in action.